Spring brings together everything amazing about Whistler, from outdoor adventure to deep relaxation. Add in a festival or two, dining specials and great deals on accommodation and you've got a cure for spring fever. 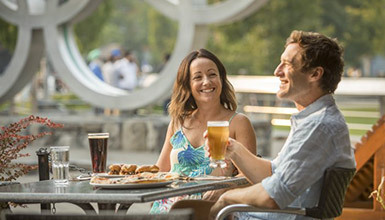 Sample the specials at Whistler’s acclaimed restaurants with the return of springalicious dining. May is for multi-sport days – ski, bike, run, golf and paddle – with time for a visit to the spa as well. 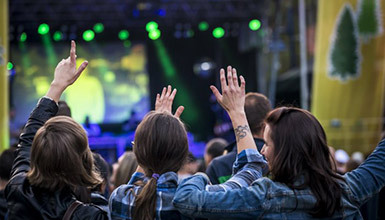 Whistler's Great Outdoors festival happens May 17 - 20, 2019 with a mix of music, sports and culture. There’s so much to see and do in spring, you’ll need plenty of time to embrace the season. Book a 2-night stay starting from $135* CAD per night. From the peaks to the lakes, spring is the time to enjoy Whistler’s multi-sport days. 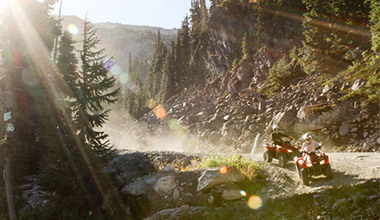 See the latest activity offers from Whistler.com. Valid for Ziplining tours from May 1, 2019. Subject to availability. Valid on Rafting tours from May 1, 2019. Subject to availability. Valid on ATV tours from May 1, 2019. Subject to availability. April through June is the time to enjoy spring in Whistler. As the days get longer the options for adventures multiply. Enter for a chance to celebrate longer days with an extended spring vacation for two. Whistler's season of adventure, through the eyes of our visitors. Follow @GoWhistler and tag your photos #OnlyInWhistler to be featured.